Broken Harbor is a cautionary tale about a once-poor country and the stresses of economic revival. Specifically, it’s a novel about the bursting of the Irish property bubble, which followed the collapse of the Celtic Tiger, a 1990s to early 2000s economic boom driven by overseas investment. 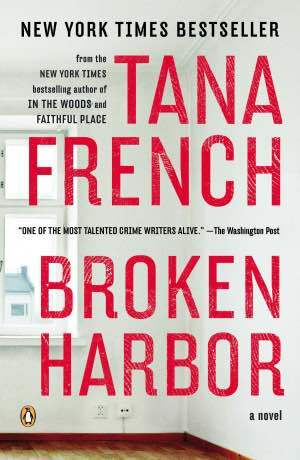 I re-read Broken Harbor recently, just as media stories began to focus on retrospectives of the 10-year anniversary of the beginning of the U.S. Great Recession. Many of them found that a sizable percentage of people haven’t yet pulled out of their recession-triggered financial crises. So, although I certainly remembered the novel as focused on the psychological challenges of financial distress, it was almost shocking to realize how much the book is about the same issues that haunt those 10-year retrospectives. In fact, Broken Harbor is the only novel I can think of that deals with the psychological effects of a financial crash and a housing bubble. It opens with the conventions of the mystery, of course. Patrick Spain and his two children Emma and Jack have been killed, and his wife Jennifer severely wounded, in a housing development near the Irish Sea. The economic concerns are clear from the outset. The housing development once promised seaside McMansions, but is now distinguished by multiple houses standing vacant and vandalized. People who bought during the economic upturn are now unable to pay their mortgages, and building ended abruptly before the development was even half completed. But the book also hints that, for all the drawbacks of the older, poorer Ireland, the community was not fractured by the desire for wealth. Now, there are fissures everywhere about money and its display. Pat and Jenny Spain obey those dictates, buying property in the firm belief that its value can only go up. As they gradually lose a financial foothold, they lose these and other friends, because any get-togethers are often based on activities they can no longer afford. In the end, one of the detectives observes they are almost completely cut off, even fearing the expense that calling on a mobile phone costs. Even so, though, the more immediate cause of the crime is a fracture of mental stability. Gradually, Pat becomes convinced that there’s an animal boring into the house and damaging it at night — and what the detectives assume are clues to his murder are actually the traps he laid to catch it, holes he drilled in the walls to unearth the lair, and baby monitors positioned to catch it in the act. Pat also leaves behind multiple online forum threads in which he frantically asks for help, because no one has ever heard the animal scratching but him. The animal is clearly a psychological projection of the stresses of financial insecurity. But Pat Spain’s contribution to the unraveling of his home and family is his belief in the power of money — itself, obviously, a type of imaginary beast. But reality doesn’t carry the day because their children have begun to believe in the beast. Worse – and this is the impetus for Jenny’s final unraveling – they have begun to tell the outside world about the beast, even though she’s told them it’s not real, and thus not to mention it. The son, Jack, talks to a shop clerk about his plans to be “Daddy’s big animal” for Halloween. The daughter, Emma, draws a picture of it for a school project. Jenny has felt secure at least — harbored — in the belief that the outside world was unaware of the family’s troubles. She lived a performative reality: as long as she and the children can appear normal, the world will take them as such — even as her husband spends more and more time destroying the physical structure of their home to find an animal that doesn’t exist. But once the children begin to talk in shops and schools about the beast, the psychological fracture, at least, has attained a public reality. Jenny Spain snaps and tries to “get us all out” of the house, killing her family and attempting to kill herself. But as germane to headlines as Broken Harbor is, the book has deeper philosophical concerns as well. French herself is a former actress, and I think she is analyzing issues of representation, and how we tell as a culture what is real and what is false. Despite a widespread perception that economics and cultural forms like plays and stories are far apart, there are ways in which their concerns are similar. Spending via debt, for example, is about materializing a physical object that’s not really there… because on a ledger, it isn’t an actual thing, but a money deficit. It’s an absence. In graduate school, I read Michelle Burnham’s Folded Selves: Colonial New England Writing in the World System, a book on economic relations in early America. She argues that early New Englanders became socially anxious about the introduction of paper money, because it was, in some sense, felt to be a potentially false representation of the worth that purportedly backed it. Burnham draws a direct line between these anxieties and the Salem witch trials. Those hinged around a panic that people could look like your neighbors but actually be the devil. In other words, everything you saw might be a false representation — and one leading you to ruin. I can’t help but think that property bubbles and financial panics are part of the reason that popular culture — especially around this time of year — is increasingly made up of horror movies in which unreal things materialize and the seemingly real is often revealed to be false. We’re trying to work through what’s real and what’s false. Spooky money, indeed. This story is part of The Billfold’s Spooky Money series.